Great interview with Amy van der Hiel, W3C Media relations. 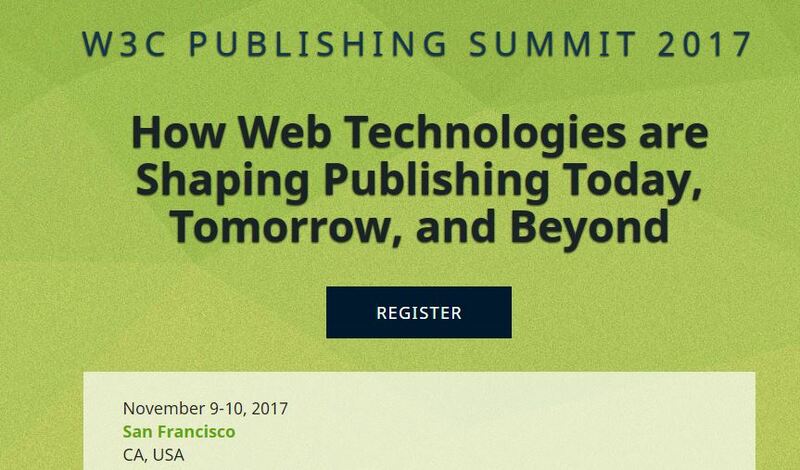 Amy introduces the W3C Publishing Summit taking place on November 9-10, 2017 in San Francisco at the Hyatt Regency San Francisco Airport. In February 2017, the World Wide Web Consortium (W3C) and the International Digital Publishing Forum (IDPF) combined organisations. The [email protected] roadmap includes plans to charter new standards work that will focus on both online as well as offline access for digital publications. The W3C Publishing Summit is the first public event for this group. [email protected] has become part of W3C’s Open Web Platform  for application development of standards that have the unprecedented potential to enable developers to build rich interactive experiences, powered by vast data stores, that are available on any device. This will be the first public Summit of this vibrant group at the innovating edge of web technologies and digital publishing. Our line up of speakers includes tech luminaries like Tim O’Reilly, Founder and CEO, O’Reilly Media (and the man who coined the terms “Web 2.0” and “Open Source”), Abhay Parasnis the CTO of Adobe as well as speakers from W3C, Google, Mozilla, Wiley and other technology and publishing influencers. The Summit will show how web technologies are making publishing more accessible, more global, and more efficient and effective. Attendees will learn about things they should be doing now to improve their products and processes; developments coming soon that they need to be aware of; and what is coming next in web publications, EPUB, mobile, and the overall Web Platform that can support their workflows on everything from today’s browsers, tablets and smartphones to tomorrow’s environments. This is an exciting event with global thought leaders and tech savvy participants located near the heart of Silicon Valley so register early. The W3C Publishing Summit will be co-located with W3C’s main annual meeting, the W3C Technical Plenary, so attendees will have the opportunity to network with Web developers and technical experts, including access to a solutions showcase demo area. This is the first W3C Publishing Summit, but we do know space allotted for public participation at the W3C Technical Plenary fills up quickly when on the West Coast. Readers can learn more at the Publishing Summit page and programme.